Supplied: In five litre containers of peat free compost, healthy and well established, approximately 70-90cm (3 feet) high, with full planting and aftercare instructions. Cherry trees are some of the most stunning ornamentals there are and few people will forget the sight of these trees in full spring bloom. Unfortunately not all gardens can accommodate their mature size since some cherries can spread as much as 30 feet. There is, however, one cherry available for the smaller garden and this is the Flag Pole cherry, or Prunus 'Amanogawa'. This is a narrow upright tree that is ideal for restricted spaces. In spring it is a spectacular pillar of blossom bearing clusters of large, pale pink, semi-double flowers, with a deeper pink margin. These fragrant flowers are held at the ends of extremely upright branches, hence the name 'Amanogawa,' meaning "Milky Way". The foliage is also attractive with the new leaves being an attractive bronze-green, turning medium green in summer and for autumn a rich crimson and gold. Flag Pole cherry may, in 20 years reach its ultimate height of around 20 feet tall but only 6 feet wide. 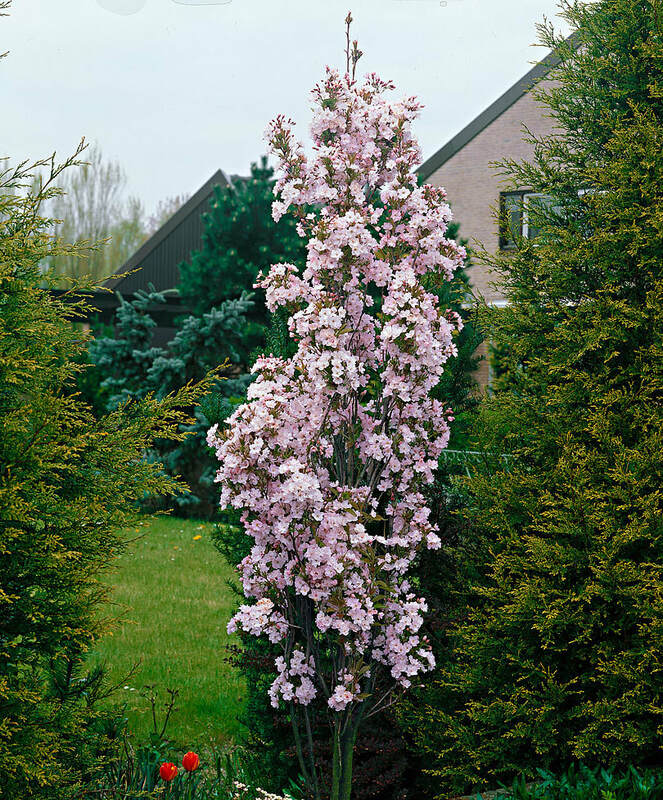 This compact column of beauty is simply one of the best ornamental trees available today for a small garden, though it would be invaluable to any garden needing a vertical statement since there are so few upright accents with such flowering. It will thrive in any soil but does need plenty of sunlight for the best display.